The cold hard truth? You’ll still pay too much for things. As a day-of wedding coordinator, I’ve learned a few things about weddings. Keep the buffet line moving. Provide plenty of parking. People have no idea how much weddings cost. It’s not their fault. There are few reliable sources of information about this kind of thing. In fact, the industry’s main survey about wedding costs comes from the industry behemoth The Knot. Their latest report: In 2017, the average cost of an American wedding was $33,391. The important word to note in that last sentence: “average.” This is not your Kardashian-West-custom-marble-table affair. This is the wedding that we’ve all gone to a million times. This is the wedding that you might like to have someday. “Well, then just elope!” you say? We’re still looking at a minimum $2,000, let alone the emotional work of fielding disappointed friends and family or, arguably more important, foregoing details that you do sincerely want for your wedding day. Again and again, I see the couples I work with caught in this bind: Do we have the wedding we want or do we have the wedding we can afford? The sad part: Even when they’re trying to have a “cheap” wedding, they’re still looking at $10-15K. The even sadder part: By industry standards, that is cheap. Fact: The average debt-carrying U.S. household has $48,951 in student loans. 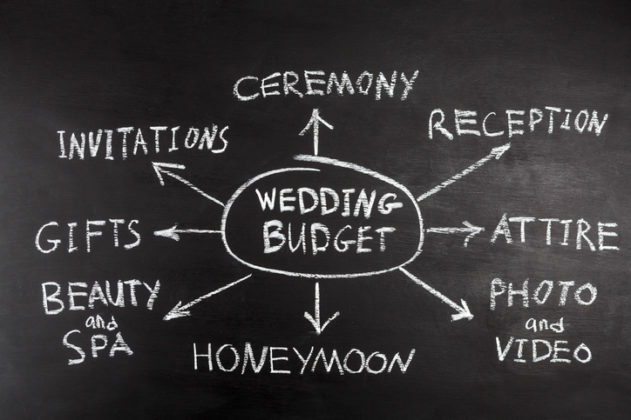 Fact: Weddings are a $72 billion a year industry. Fact: Couples shouldn’t have to settle for less because the system is rigged against them. But so often they do. The least we can do as their loved ones? Not make them feel guilty about it (and, if you feel so moved, give them the gift of cash rather than china). But the cold hard truth? You’ll still pay too much for things. The important part is to try, as much as possible, to give yourself permission to focus on those parts of your wedding that matter the most to you and to pay less attention (and ideally, less money) on those that don’t.